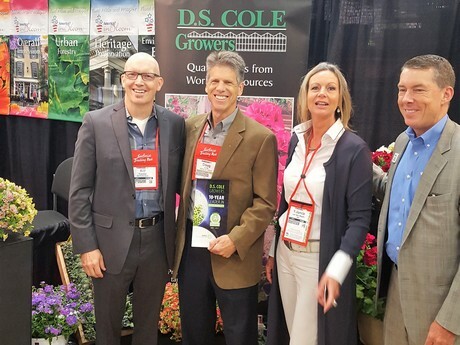 At Cultivate ’17, the trade show where the “green” sector in North America meets from July 15 – 18, MPS also presented themselves. As a worldwide player, and active in the US market for ten years in the field of sustainability certification, MPS doesn’t want to miss Cultivate ’17. D.S. Cole Growers is one of the North American pioneers, who from day one has been in favor of the MPS-ABC certificate. As a company that grows young plants as well as potted plants, sustainability is a central focus in all aspects of the production process. D.S. Cole believes in making this clear by means of the MPS-ABC Certificate. Customers appreciate their transparency. Beside transparency, the MPS-ABC certificate stands for continuing innovation in the field of sustainability. It is not however an alibi to request higher prices. D.S. Cole is looking back at 10 years of company certification and that as long as the company staff is supportive of the certification philosophy, the outcome will be a success. This staff buy-in is important not only during the qualification process but also on a continual basis going forward to continue making improvements which in the long run also saves the company money. From pioneering to innovation D.S. Cole looked at several areas and focused first on what they discovered as inputs that were in excess of benchmarks. This applies to water; energy and fertilizers. Since the least number of crop protection agents grow the best products, knowledge of Crop Protection Agents (chemicals) is a good starting point to achieve certification. Which chemicals are the least harmful to the environment? D.S. Cole quickly realized that MPS can identify these products and they not only made steps to become more sustainable but were quite often able to produce at a lower cost. D.S. Cole notices that more and more growers in North America are involved in sustainable certification. The MPS-ABC certificate can make large steps in both efficiency and sustainability. In addition, D.S. Cole also carries a GAP certificate from MPS. They would like to see the MPS-GAP certificate gain popularity in the US. For the future, it will be interesting to see if the big box stores/large retailers in North America will demand sustainability certification from their suppliers/growers. If that will be the case, even more so than currently, it will be a trigger for many companies to focus on sustainable and transparent production processes within all aspects of the floricultural chain. On Monday July 17th, 2017, Yolande van de Boom, CEO of MPS, presented Doug Cole from D.S. Cole Growers an award to show the appreciation and gratitude for a decade of cooperation between D.S. Cole Growers and MPS. Yolande stressed the importance of global sustainability. Floriculture is an international sector that involves many parties all over the world. Therefore it is important to work on sustainability and transparency in the supply chain structurally and over multiple years. 2019-04-25 Wondering what a Field to Vase Dinner is like?